Smile Denture and Implant Clinic offers denture rebase services to our patients. Rebase is necessary in cases when the denture teeth have not worn as thoroughly as the denture base material. Rebasing is a process of retrofitting dentures by replacing the acrylic denture base. Hence, the procedure will replace the entire denture base. 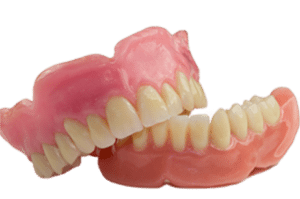 Denture base is the plastic portion that stimulates the gum tissue. This process provides a stable denture that incorporates denture teeth. Rebasing a denture involves replacing the entire base of the denture, while keeping the teeth intact. Rebasing as opposed to relining means that denture’s effective life span can be extended. Rebasing can improve fit, vertical dimension (height of the teeth of the denture), facial appearance and denture strength. Moreover, it’s a more complex process than relining a denture and it requires going without your dentures for several days. However, often our patients will present with a case of DIY denture repair kits. This is very common situation where patients used super glue to repair denture and this sometimes caused an irreparable damage to the dentures. We advise you to contact our denturist prior to embarking upon a risky and often times costly denture alterations. Often times because super glue is inadequate solution, underlying oral health issues may emerge such as inflamed gum tissue and infections. To ensure you get the best treatment you need our denturist is in the best position to assess your options and discuss possible treatment plans. Moreover, we will keep you fully informed and educated on your options and why one treatment may be preferable to another. At our Denture and Implant Clinic, we offer many denture services that can restore your smile. Contact our denture clinic today and allow us to restore the smile and confidence back into your life!